Chester County municipalities are increasingly incorporating single stream recycling into its overall municipal waste collection and recycling efforts. Single stream recycling, also known as "fully commingled" or "single-sort" recycling, refers to a process in which paper fibers, plastics, metals, and other containers are mixed in a collection truck, instead of being sorted by the resident into separate commodities (newspaper, paperboard, corrugated, plastic, glass, etc.) and handled separately throughout the collection process. In single stream recycling, both the collection and processing systems are designed to handle this fully commingled mixture of recyclables, with materials being separated for reuse at a materials recovery facility. The recycled materials themselves can either be picked up directly from residential and commercial locations, or taken to regional drop-off recycling centers. Greater Energy Savings: Recycling programs inherently conserve energy because they lessen the dependence on the initial production of raw materials. Public Acceptance: There may be the potential for diminished public confidence in the concept of recycling if more recyclables are destined for landfill disposal due to contamination or lack of marketability. Pennsylvania Act 101, the Municipal Waste Planning, Recycling and Waste Reduction Act, was adopted in July, 1988 and mandates recycling in Pennsylvania`s larger municipalities. The Act requires counties to develop municipal waste management plans, and provides for grants to offset expenses. The goals of the Act are to reduce Pennsylvania`s municipal waste generation; recycle at least 25% of waste generated; procure and use recycled and recyclable materials in state governmental agencies; and educate the public as to the benefits of recycling and waste reduction. Municipalities with populations of at least 10,000 had to implement curbside recycling programs by September 26, 1990. Municipalities with populations between 5,000 and 10,000 and more than 300 persons per square mile had to implement curbside programs by September 26, 1991. Mandated municipalities collect at last three of the following materials: clear glass; colored glass; plastics; aluminum; steel and bimetallic cans; high grade office paper; corrugated paper and newsprint. Municipalities should consider adopting ordinance provisions for recycling in their community to help implement Act 101, as either a stand-alone ordinance or as a component of the Solid Waste Chapter of the municipal Code of Ordinances. The issues that the ordinance language should address include the following: applicability of recycling program efforts, materials that can and can't be recycled, the designation, authorization and reporting requirements for authorized haulers, collection schedules, public information programs, and compliance and enforcement provisions. The ordinance language should also provide separate, distinct provisions for residential requirements versus commercial/municipal/institutional requirements. Grant funds are available for the development of municipal recycling programs. Pocopson Township refer to Chapter 174, Article IV Recycling. West Goshen Township Chapter 45, Garbage and Recycling. West Whiteland Township Chapter 264, Solid Waste and Recycling. Willistown Township Chapter 87 of the Township Code, Article IIIâ€”Recycling. Section 301(a)(4) of the Pennsylvania Municipalities Planning Code (MPC) states that a municipal, Multimunicipal or county comprehensive plan shall include a plan for community facilities and utilities, which may include solid waste management and other similar facilities and uses. Additionally, the MPC states that a plan shall include a statement of the interrelationships among the various plan components, which may include an estimate of the environmental, energy conservation and social consequences on the municipality (Section 301.(a)(4.1)). 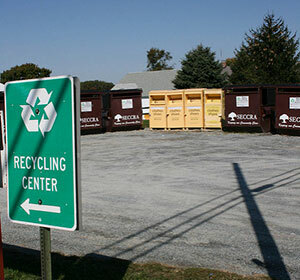 The Southeastern Chester County Refuse Authority website provides general recycling information, along with the location of single stream recycling centers in southern Chester County, and the materials currently being accepted. There are currently 11 drop-off recycling centers in the SECCRA service area, including the SECCRA headquarters in London Grove Township.